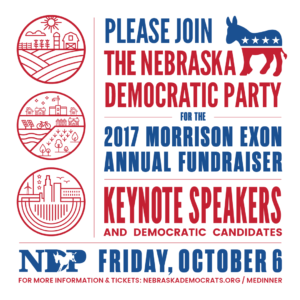 The annual fundraising event for the Nebraska Democratic Party is called the Morrison Exon Dinner. At the event, we present awards to hard-working volunteers and hear from state and national speakers. Note: Online tickets ended on Oct. 3, a limited number of tickets will be avail at the door of the event. The event originally sold out but we added a handful of tickets for people who still want to attend and pay at the door. 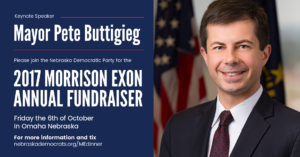 We are excited to announce our featured speakers Rep. Debbie Dingell from Michigan and Mayor Pete Buttigieg from Indiana. Mayor Pete Buttigieg, a young veteran and often thought of as “America’s future first gay President.” Mayor Pete serves the growing town of South Bend, Indiana. 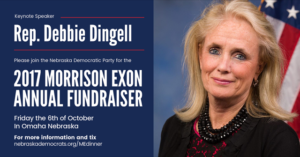 Rep. Debbie Dingell, a Congresswoman from Michigan’s 12th district. Rep. Dingell represents working-class families with a key focus on the auto-industry, women, and children. She has a long history of increasing resources for breast cancer research. Hotel Rooms: (block is now closed) A discounted rate of $109 for rooms at the Hilton is now available. You can call in 1-800-HILTONS and use group code DEM. The discounted rate can also be secured online with this link: https://aws.passkey.com/go/NebraskaDem2017. The deadline to submit the award nominations was Sept. 6, 2017 at 5pm CT. Nominees for this award should be a volunteer who personifies the spirit of the Nebraska Democratic Party. The award is given to an individual who is tireless in supporting the Nebraska Democratic Party activities and campaigns for Democratic candidates, and creates a positive image of the Party and its candidates within District 1, 2, and 3, respectively (one per Congressional District). Nominees for this award should be a young person (using the age criteria of the Young Democrats which is under 35 years old) honored for their exceptional volunteer activities and participation within the Party. This individual must also be active in energizing other young Democrats with Nebraska Democratic Party ideals and principles. Nominees do not have to be specifically affiliated with an organized Young Democrat group. Nominees should be a volunteer who personifies the spirit of the Nebraska Democratic Party. The award is given to an individual who is tireless in supporting the Nebraska Democratic Party activities and campaigns for Democratic candidates, and creates a positive image of the party and its candidates. Nominees should be elected officials who are dedicated to the principles of the Nebraska Democratic Party and who have contributed above and beyond the call of duty to the Nebraska Democratic Party and Democratic candidates for public office. Nominees for this award should be a County Party officer who has worked tirelessly to promote the activities and values of the Democratic Party in their county and throughout the state. This individual should have served, or continues to serve as an officer of their county party in the last year. Nominees should demonstrate a dedication to service, integrity, the organizing of their county party infrastructure, and support for local Democratic candidates. Nominees should be someone who is dedicated to improving both the Nebraska Democratic Party and their community. This award is given in honor of Carrie Howard.